With just one month to go before the first round of the French presidential elections, at least 90,000 bikers gathered this weekend in every town and city across the whole of France to remind candidates that they had better come up with a robust road safety policy if they don’t want to see the whole nation brought to a complete standstill on a regular basis and during their presidential time. The thousands of bikers, represented by the extremely powerful French Federation of Angry Bikers (in French: Fédération Française des Motards en Colère), demonstrated across the whole country this weekend and blocked all cities and towns for hours to demand from the government a motorcycling road policy focused on safety rather than the constant implementation of stupid and meaningless measures designed to treat motorcyclists like cash cows. According to the impressive 90,000+ angry bikers who demonstrated this weekend, the French government has so far failed to recognise that motorbikes and scooters are the SOLUTION to transportation, pollution and congestion issues, certainly not the problem. The angry bikers want their government to recognise that motorcyclists, like any other motorists, are responsible road users and it is therefore totally inappropriate to constantly and blatantly punish them with repressive measures. French bikers demand the introduction of a new module in the driving test to make motorists aware of the presence of motorcyclists on the roads and teach them how to share the roads with them in a safe manner. Why does the motorcycle training programme teach riders how to take care of cars on the roads whereas the car driving training programme does not teach how to take care of motorcycles? French bikers also demand the introduction of road safety courses in school education, the improvement of road conditions and maintenance nationwide as they claim there are too many hazards on the roads making riding unsafe and dangerous. They also demand from the government the full and permanent scrapping of a proposed legislation to force all riders to wear 150m3 of reflective clothing around the arm in an attempt to make them more visible on the roads, when statistics clearly show that the vast majority of accidents involving motorcyclists are caused by car drivers not paying attention or not looking into their mirrors due to poor or no training. France was the scene of angry bikers blocking the roads nationwide and everywhere, including motorways, city/town centres, ring roads, flyovers and express roads. Even the smallest towns saw at least 100 bikers protesting and expressing their disgust at the existing government’s attitude towards motorcyclists. Because of the time difference with mainland France, the first demonstrations took place in the French overseas territories including the beautiful volcanic island of Réunion (located off Madagascar and Mauritius) where 500 bikers took over the roads between Saint-Denis and Saint-Paul and gathered outside the local council offices. The demonstrations continued with hundreds of bikers gathering in other French overseas territories, including the islands of Martinique and Guadeloupe in the Carribean and also New Caledonia located off Australia and New Zealand. Hundreds of bikers' demonstrations took place all over France on Saturday 24 March 2012 and in Paris on Sunday 25 March 2012. There was not a single town or city that was left out! 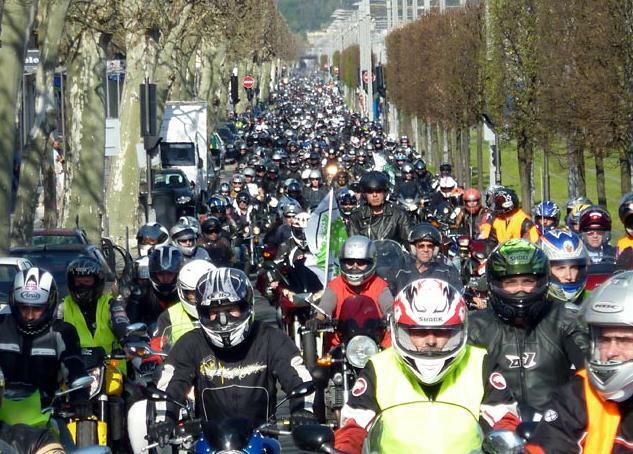 The demonstrations then hitted mainland France with more than 90,000 angry bikers protesting nationwide on Saturday and Sunday (including – to name a few – 10,000 in the second largest French city of Lyon, 7,500 in Bordeaux, 6,500 in Lille, 3,000 in Strasbourg, 1,500 in Nantes, 4,500 in Brittany including Brest, Rennes, Quimper and Saint-Brieuc, 650 in Cherbourg, 2,000 in Clermont-Ferrand and Saint-Etienne, 2,000 in Tours, 1,200 in Dijon, 1,000 in Grenoble, 690 in Nevers and 680 Auxerre). 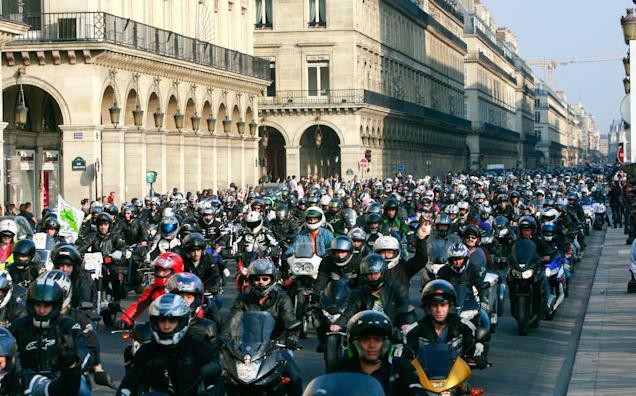 Paris alone saw more than 15,000 bikers on Sunday, blocking the whole traffic and making the heart of the French capital truly theirs! 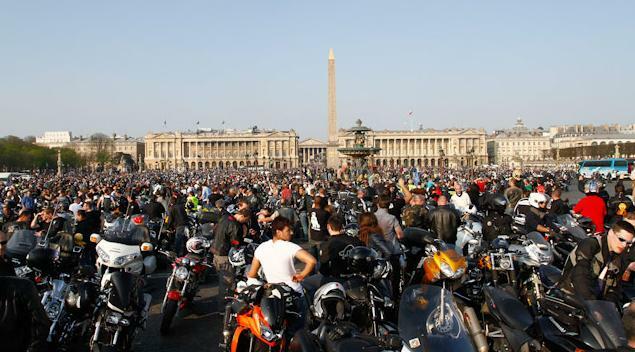 More than 15,000 bikers gathered on Place de la Concorde in Central Paris shouting at the goverment in a carnival atmosphere and reviving their engines to express their anger and remind the authorities that bikers are voters and are entitled to have their say in transport and road safety policies. More than 15,000 bikers join the protest ride in Central Paris to express their anger at the government's existing measures to treat them like cash cows. "The government must replace their money-grabbing measures with robust road safety policies and we will go away, otherwise they must be prepared to see the whole country brought to a complete standstill until we obtain what we want" said a protestor whilst reviving his engine in fury and anger. 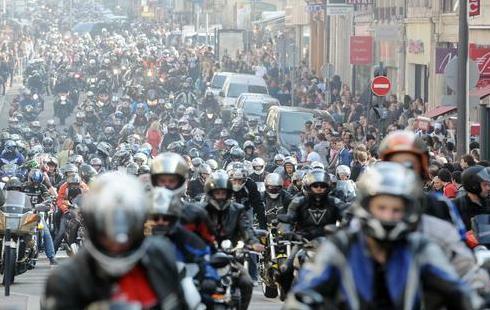 The bikers’ demonstrations made the national news on television, radio and newspapers throughout the weekend. The ball is now in the court of the government and all presidential candidates for them to come up with a revised road safety policy that satisfies the angry bikers, otherwise France will continue to see enormous demonstrations that have the power to humiliate the government and bring the whole country to a complete standstill. No retreat, no surrender! CONGRATULATIONS TO ALL FRENCH BIKERS FOR STANDING UP AGAINST THEIR GOVERNMENT AND HAVING THE COURAGE AND DETERMINATION TO SAY ENOUGH IS ENOUGH! We now leave you with a series of videos that will give you a good idea of how French bikers demonstrate and cause complete chaos when they are angry. 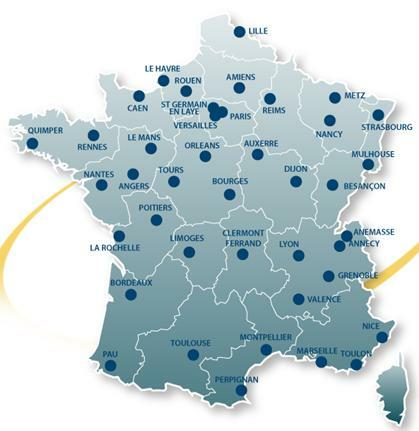 If you’re based in France and want to take part in the fight against the Government’s proposed introduction of a compulsory annual environmental and road safety test for motorcycles and their continued policy to ban motorcyclists from filtering through traffic, then contact the Fédération Française des Motards en Colère (FFMC – French Federation of Angry Bikers). Si vous habitez en France et souhaitez participer aux manifestations contre la proposition du gouvernement d’introduire un controle technique pour les 2 roues motorises ansi que de continuer a empecher la circulation inter files pour les motocyclistes dans les embouteillages, contactez la Fédération Française des Motards en Colère (FFMC). Congratulations to you all well done. Outstanding demonstration. Well done: the pictures are fantatstic! And how bloody amazing is it that the support is shown in your overseas territories! Damn, we’re lucky if we get people in the next county to stand up for biker’s rights! Good luck with your efforts, mes Amis. You can embarrass Sarko and the green zealots into capitulation. VIVE les motards Français. That’s how a demonstration should be done. Well done to each and every one of you that turned up to fight for your right to ride your bike, how you see fit. It’s just a shame that so many so called, ” Motorcyclists”, are still burying their heads in the sand in with the same old excuse, ” Oh that won’t affect me “, It bloody well will, if this crap is allowed to spread to other countries. The French bikers are at the forefront of the fight to ride how they see fit. The least the rest of us can do to help them is to join MAG before it’s too late. Thank you French bikers for fighting for my right to ride in whatever I see fit. Absolutely amazing. The solidarity amongst the French bikers should be an inspiration to the British bikers who are allowing apathy to be their own worst enemy in bike parking taxes. Holy cow !! In Frankfurt Germany we call it a great success when we round up about 300 bikers to open the new season and 2500 in the region to demonstrate for some demands…. but 90.000 is TOP !! Chapeau!! 40,000 bikers in the UK protested all over the country last year staging a go-slow for an hour about the planned new EU regulations on biking and got virtually sod-all coverage in the national media and little interest from MPs and MEPs. How many are willing to stand up for our way of life in the UK?? The raft of legislation coming in from the EU to the UK with no veto will kill our way of life forever. No use crying after the horse has bolted. Get off your asses now, get to a MAG meeting and lets demonstrate to stop this NOW! Do you know that bikers who are members of the riders rights groups in the UK amount to just 1%. I never in my wildest dreams thought that I’d be in the 1% bracket. You have obviously signed the Motorcycle Action Group petition as I have, unfortunately only 7,036 Bikers / Motorcyclists can be bothered to sign it. I can’t understand why more haven’t signed. “IT’S FREE TO SIGN EVERYONE”. the closing date to sign this is April the 9th at 08.45. The response to this petition is PATHETIC, and lets down not only the UK bikers, but is a slap in the face to the French bikers. Please Please Please sign this petition NOW, or as Ant correctly said, “No use crying after the horse has gone” Here is the link to the petition, and when your done, send this link to as many biker friends has you can think off, and get them to do the same. http://epetitions.direct.gov.uk/petitions/26931 SIGN THIS NOW. DO YOU CARE ENOUGH ????? Nice one all you French bikers, fantastic turnout and very well organised. the french know how to stick 2 fingers up to the goverment! lol. I just got back from Southern France and was surprised at the lack of motorcycles following any traffic laws.and riding with complete abandon to safety. I understand filtering up in traffic but the bikes would travel between stopped lanes of cars 50 KPH, the slightest change in cars changing lanes was disastrous. I can’t count the number of times a light would turn green and the first car would start up and have to slam on the brakes because a bike coming up the side would cut them off. The up side is you make all US bike riders look like pros. What is the life span of a rider in France and Italy, I saw three bad accidents in 2 weeks. It was so funny my wife and both commented on one riders using a directional for a lane change, the only time we saw that. The car drivers are fast but predictable and safe. Ive been riding m/c’s for 30 years. If you hit us off the answer is “I didn’t see you” so use your mirrors !. So we buy loud exhausts so you can at least hear us. Then we get fined for being to noisy. Someone should pass a law to make everyone pass a motorcycle test and ride for at least 2 years before allowing them to have a car license. That will make all the car/van drivers more aware of bikes!!! Congratulations. You make it. I’m sure to be back for more updates. Thanks!